With each passing year, digital pianos like the Casio PX860 BK Privia digital piano get more and more effective at recreating not only the sound but also the feel of the world's finest acoustic grand pianos. At the same time, companies continue to outfit their digital pianos and keyboards with a growing array of high-tech bells and whistles, like LCD screens and wireless connectivity. In fact, one helpful way to think of the various digital pianos on the market today is to picture them on a spectrum, with digital pianos trying to completely recreate the acoustic piano experience on one extreme and a digital piano with an LCD screen, hundreds of voices, and wireless connectivity to mobile devices on the other. On one far extreme of trying to completely recreate the acoustic piano experience as authentically as possible, we find the Casio PX860. For today's review, we've decided to take the Casio PX860, which goes to extreme (some would say insane) lengths to capture the sound and feel of an acoustic piano in a digital model, and compare it against three other top models spanning the remainder of the spectrum. Hopefully, this will give you a better understanding of what different digital pianos have to offer and which model is best for you. What Is the Casio PX860 Digital Piano? The Casio PX860 is a digital piano designed and built to recreate as closely and authentically as possible the sound and playing experience of a full-sized, acoustic grand piano. The Casio PX860 cannot make itself sound like a guitar or a string section, and it won't display sheet music on an illuminated LCD screen, but it will give you an incredibly realistic acoustic piano experience. The PX860 features an 88-key, full-sized keyboard with tri-sensor keys that do an amazing job recreating the weight of an acoustic grand piano, and its 256-note polyphony is the highest among models we looked at. The four-speaker built-in sound system also delivers impressive performance without the need to plug into a separate set of speakers. Given Casio's efforts to recreate the feel and sound of an acoustic grand piano down to the most minute detail, the Casio PX860 is just about as straightforward and easy to use as its acoustic cousins. The Casio PX860 is designed to replicate as closely as possible the feel and sound of an acoustic grand piano in a compact, digital design. To this end, Casio's proprietary Acoustic and intelligent Resonator (AiR) processor achieves incredible sound reproduction. According to Casio, the AiR processor can access three times as much memory as its predecessors. In terms of sound production, this means the Casio is able to derive its sounds from more detailed samples that capture the intricate nuances of a grand piano incredibly well for a digital model, including some of the longest decays we've heard on a digital piano. 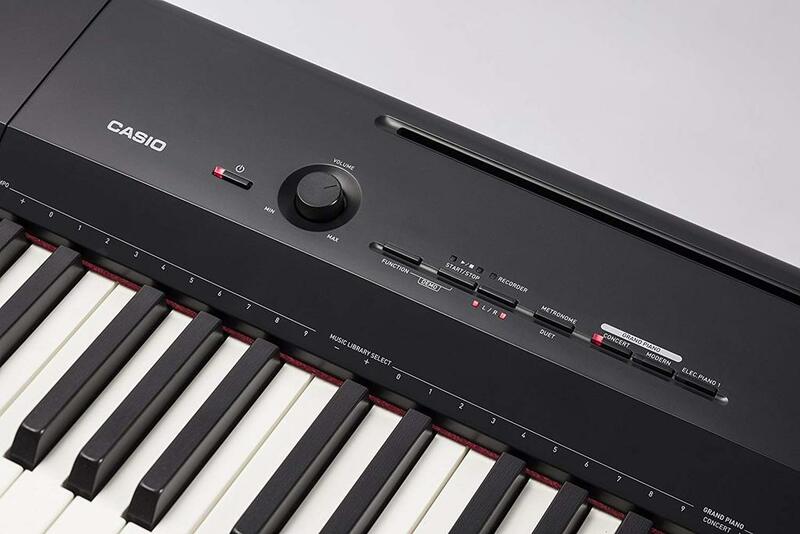 The Casio PX860 also includes the connectivity we've come to expect in a modern digital piano, including class-compliant USB connectivity, allowing the Casio PX860 to connect to a Mac or Windows PC without the need to install additional drivers. The Casio PX860 also can be connected to an Apple iPad by using Apple's Camera Connection Kit. However, the Casio does not offer an optional wireless accessory, as do some of the other digital pianos in our group. To effectively replicate the feel of a grand piano, one needs a solid design and sturdy base, both of which the Casio PX860 deliver. 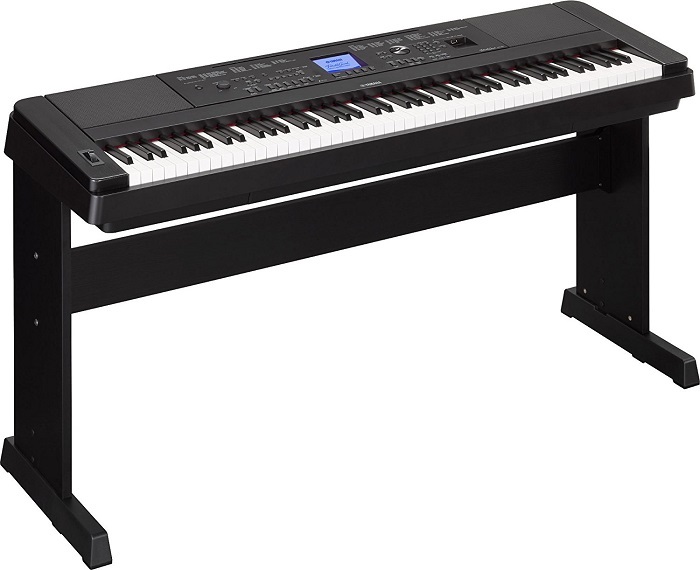 Despite its small stature as compared to an acoustic piano, the Casio PX860 does not wobble or shift during playing, and the key action on the 88-note Tri-sensor Scaled Hammer Action II keyboard reproduces the touch and versatility of an acoustic piano as well as any digital model we've played in this price range. In this sense, the attention to detail on the Casio PX860 borders on the obsessive: Casio's Hammer Response technology actually takes into account the way the velocity at which a key is struck will result in different hammer speeds. The end result is an incredible sound and feel, along with one of the best design qualities we've seen on a digital piano for under $1,000. The Casio PX860 comes with a one-year warranty against defects in materials and workmanship. However, this warranty does not include the battery or the case. The Yamaha DGX-660 is a portable digital grand piano that focuses more on modern, high-tech features and less on authentically recreating the sound and feel of an acoustic grand piano. Despite all of its high-tech wizardry, the Yamaha DGX-660 is remarkably intuitive to use, thanks in large part to a multifunctional display panel and big LCD display screen. While the Casio goes all-out in an effort to authentically recreate the sound and feel of an acoustic grand piano down to the minutest detail, the Yamaha DGX-660 taps the potential of its digital capabilities to offer a host of high-tech features that deliver a much wider variety of sound options but perhaps not the delicate nuance of the Casio. For example, Yamaha's Live! Cool! Sweet! Voices allow the user to mimic the sounds of other instruments like guitar, bass, or even a string section, and the Piano Room feature includes sounds from several different piano types and acoustic settings to mimic a variety of playing environments, from a standard room to a concert hall. Despite the high-tech features, Yamaha hasn't overlooked the importance of recreating the feel of an acoustic grand piano in its digital pianos. 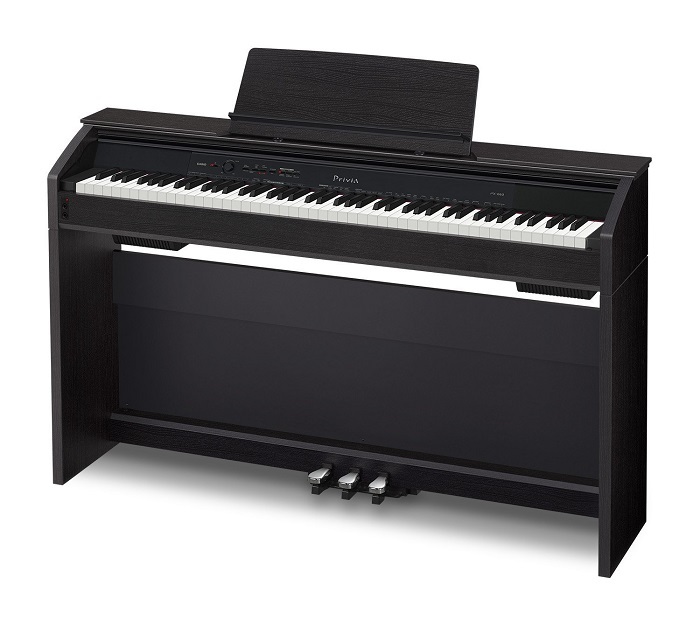 While the portable nature of the Yamaha DGX-660 means that its sturdiness will depend a great deal on the setup from location to location, when paired with a quality stand, this Yamaha digital piano delivers the sturdiness you'd expect from a high-end digital piano. Yamaha digital pianos come with a 3-year warranty, three-times the length of the warranty on the Casio PX860. This 88-key digital stage piano is made with the touring musician in mind, as it packs top-level, professional sound into a relatively diminutive, lightweight, travel-friendly design. With fewer buttons and switches on the face of the digital piano than the Yamaha, the Roland RD-300NX still features more digital amenities than the Casio PX860, which it has incorporated into a simple, straightforward design. However, if Roland was going to include an LCD screen, which it did, we wish they had made it as large and multi-functional as that on the Yamaha. Like the Yamaha DGX-660, this Roland digital stage piano incorporates more high-tech bells and whistles than the more straightforward Casio PX860. Similar to the Yamaha, the Roland RD-300NX offers wireless connectivity to iOS devices via an accessory that is available separately, or it can connect to your iPad via USB and Apple's iPad Camera Connection Kit. The Roland RD-300NX is purpose-built to be smaller and lightweight than the other digital pianos we looked at, especially the non-portable Casio PX860. As such, it definitely has a different feel than either the Casio or the Yamaha. However, the 88-key Ivory Feel-G keyboard feels solid and the keys have an appropriate weight to them. Roland provides a limited 1-year warranty on its digital pianos and a 90-day warranty on accessories. Designed around low cost and portability, the Kawai ES-100 features a simple, straightforward design and a price that is hundreds less than the other digital pianos we looked at. While the Kawai does not have the top-of-the-line acoustic-piano feel and sound of the competing models, the Kawai ES-100 will fulfill the needs of most amateur musicians. And, with built-in Alfred Piano Lessons included, the Kawai ES-100 is a functional, high-end digital piano for learners. The Kawai ES-100 is simple and straightforward to use. While it may lack some of the features on other models, it is a solid instrument for learners. While the Kawai ES-100 does not have the digital bells and whistles of, say, the Yamaha DGX-660, it does feature a surprising amount of connectivity options, including MIDI in and out jacks for connecting the digital piano to a computer or other instrument, as well as two headphone jacks, which can be helpful when an instructor wants to listen in on the session. While the sound produced by the Kawai is good, compared to top-of-the-line digital pianos from the likes of Casio, Roland, and Yamaha, the Kawai ES-100 simply does not recreate the sound of an acoustic grand piano to the same degree of precision and nuance. However, the Kawai still offers more than enough sound quality for an amateur, at-home user. While the Kawai ES-100 does not go as far as the other models, particularly the Casio PX860, in attempting to recreate the acoustic grand piano experience, the feel provided by the Advanced Hammer Action IV keyboard is sufficiently acoustic-like for learners to be able to transition effectively between this digital piano and acoustic models. The Kawai digital piano comes with a limited 3-year warranty on parts and service. The 3-year warranty period is tied with the Yamaha for the longest in the group. If you're looking for an authentic, acoustic grand piano experience in a non-portable digital piano, you'd be hard pressed to do any better than the Casio PX860 digital piano, particularly for under $1,000. That's why we've decided to give the Casio PX860 a rating of 4.5 stars overall. However, each of the other models we've looked at have their niches. For the professional musician on the go, we'd recommend the Roland. For those looking for the most high-tech bells and whistles, we'd recommend the Yamaha. And, for beginners, we'd go with the Kawai and its built-in Alfred Piano Lessons.